For a bar that is located on Ponce de Leon, The Drunken Unicorn still manages to be difficult to find. The entrance is a single door down a few steps, tucked behind a MetroPCS and beneath the Friends On Ponce bar. It is a definitive hole-in-the-wall joint that regularly hosts local bands and artists. On Saturday April 8, Tech’s student-run radio station WREK held their annual benefit concert, WREKtacular, there. The show is also a celebration of local, independently-produced art and music, the kind that this venue hosts on the regular. On the average night, shows like these might not see a high turnout rate as local music is usually experimental and unpolished and may not seem the most accessible. However, on this Saturday, the place was packed. The lineup included Georgia Tech’s own Root Locust, KayyP, Vampire Stepdad, Bitter and Deantoni Parks, who has been rising in popularity because of his blend of electronic and hip hop elements. The show brought an eclectic variety of local talent to the table and gave Tech students a taste of the unique music Atlanta has to offer. The local arts scene may sometimes seem insular to those who are not already a part of it. However, once a year, WREK Radio offers Tech students a chance to experience it. The radio station prides itself in its airing of music that they describe as “atypical” or outside the cultural mainstream. On their website, WREK claims that they wish to use their status as a college radio to bring these “forms of music into public consciousness,” and the annual concert plays into that philosophy. It opens the doors to Atlanta’s underground scene for Georgia Tech students, who can attend for free. The community and atmosphere there were just as important as the art itself. Throughout the night, the light effects remained minimal. The only noticeable décor gracing the stage were two cutouts of unicorns. The music, however, was thriving. WREK Radio’s own Victor Pino was first on the lineup, performing under the name Root Locust. Pino is an Electrical Engineering major at Tech, which does not seem surprising considering that the setup for his performance on Saturday was designed and built by him over the course of two years. It consists of a modular system, which includes a pulse generator and a shift register sequencer, so sounds play off inputs to the system and work iteratively. Root Locust’s work is characteristically DIY. The music itself, composed of abstract electronic melodies and sounds, was just as impressive as the spectacle of his handmade instruments on stage. The rest of the night was filled with equally strong performances. KayyP rapped over synthesized, well-produced beats, and her stage presence and energy changed the night’s gears from a dreamy electronic haze to more charged and upbeat. Her lyrics are introspective and soulful, and in a genre in which women are sorely underrepresented, she holds her own as one of Atlanta’s strongest rising hip hop artists. Vampire Stepdad brought their brand of synthwave: a homage to the music of 80’s horror and science fiction cinema, like that heard in John Carpenter’s “Halloween” themes with ethereal, retro synths. The performers stayed true to the “stepdad” part of their act’s name too, staying in character throughout for a gimmick that did not add anything to the performance itself. Some of the jokes about dating the audience’s collective mother could have been dropped without losing any of the 80’s cultural spirit that the artists wished to capture. Between performances, The Wrecking Crew All-Star’s DJ Tone Fresh kept the atmosphere lively with his mixes. With 30 years of DJ experience, he has performed at bars and clubs around the city. However, one thing that he said sets events like WREKtacular apart is that he is able to play a more diverse range of music and explore more experimental genres, instead of the classic hip-hop he usually plays. 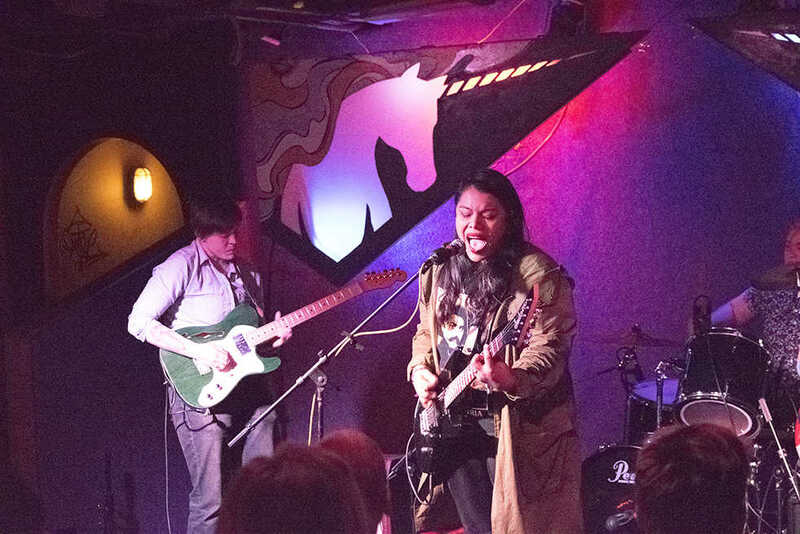 All-female-and-agender punk band Bitter brought their style of garage-style rock, which is simultaneously loud, assertive and melodic. Lead vocalist Maritza’s voice is powerful enough to hold together noisy, grungy guitar riffs and plodding drums. Experimental drummer Deantoni Parks rounded up the set. Parks’ incorporation of woozy sounds and synths with the thumping drums were the result of him singularly working both instruments on stage and even live in the studio. With one hand playing the drums and the other on his sampler, Deantoni Parks is an artist one needs to see live to understand the work. The pumping rhythm of the drums gives his samples and electronic sounds an acoustic, organic feel. Like the artists that performed before him, Parks proves that in the underground music scene, the artist is not only defined by their music, but also by their tools, their craftsmanship and the processes through which the art is created. At the end of the night, the show was what one would expect from a lineup of skilled, local talent pushing the boundaries of their genres, with some fresh faces from Georgia Tech in the crowd. in person rather than through the airwaves.